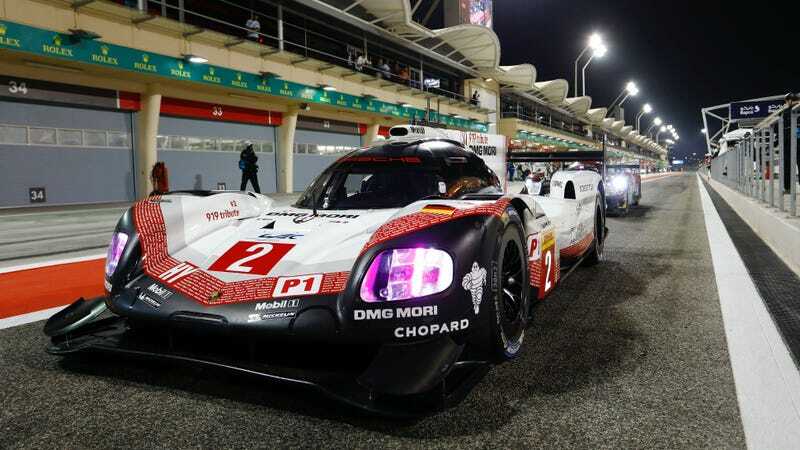 This will be Fox’s last year broadcasting the World Endurance Championship for now, as even the series is tired of having Le Mans coverage unexpectedly swapped for golf highlights. While the WEC has given fans the live stream we want for years, the biggest problem is that auto racing’s sponsors haven’t caught up with them on the idea of streaming yet. The World Endurance Championship will not be renewing Fox’s contract to broadcast WEC races (including their flagship 24 Hours of Le Mans race) next year. Currently, the series is in talks with “several broadcasters” over the contract for 2018 and beyond, according to a series spokesperson. An announcement on who will broadcast WEC races in the United States for the forseeable future won’t be made until early 2018. Fox really have been piling on inventories, as we call it, with soccer and several [others]—we’re just getting squeezed. So, we’re going to change. The sponsors who keep racing series’ lights on still all too often judge whether or not a series is worth spending money on by its TV numbers. Worse yet, there are so many sports—including those with more established followings in the U.S. than the WEC—vying for that sweet, sweet TV time. Finding time for even the series’ shortest six-hour races under those circumstances has proven to be extremely difficult. To those sponsors’ credit, regular broadcast television is still somewhere new fans can find a new racing series to follow by sheer merit of it being on and available—for now at least. But focusing on TV in 2017 is beyond short-sighted, as it doesn’t factor in the reach of the WEC’s own live stream and the numbers of existing fans who already tune in there. The days of just forcing down the pipe are over. The consumer decides when they want to pull it out of the pipe, and which pipe they want to pull it out of. So, that’s all good, because you’ll also be able to offer more variety, and I talked about this years ago—long before it was even possible—you choose whether you want to view from the helmet cam, the camera on the front of the car, the camera in the car, whatever—and you’ll be able to do that. And it’s getting cheaper and cheaper and cheaper as the technology improves, becomes commonplace. Now Formula One—arguably the auto racing world’s most widely known series—is finally trying to follow in the WEC’s footsteps with a customizable live streaming service of their own. So, why aren’t sponsors catching on to this? So much for “eyeballs” if no one’s watching regular TV. It’s hard to see the existing cable model of selling of big, multi-channel packages full of programs and channels you’ll never watch staying viable with so many viewers now opting out of it. Even free-to-air network TV a la your local ABC/NBC/CBS/FOX affiliate is going to have to make big changes, particularly if revenue from their deep-cable off-shoots shrinks. It’s not like we’re whipping out the mini-TV anymore when our phones now also alert us that we’re about to get blown away by a tornado, either. I have to also say that the future of television is—I’m now speaking to a sort of broader base, but the days of network television for many sports are over. What we need to do and what many sports need to do is to make sure we’re reaching our fanbase on their terms. Engagement is what matters. For news and for certain mega-events—the Super Bowl and the sort, sure, there’s an opportunity on network. But frankly, and personally, if you want to watch a movie, you’re not watching on network TV—we’re watching on Netflix, or wherever. [...] [Streaming] is the future. Craig stressed that North America was important, both for the series and its manufacturers, so figuring out how to show races to us more successfully is a major priority for them. Hopefully whatever cable deal comes next doesn’t turn out for the worse, like an edited-down highlights package on upper-tier cable that even fewer people get than the unobtanium Fox Sports 2. We may make fun of how commercialized things like the Dunlop 500 Presented By Cheetos Fisher-Price Pass Of The Day can get, but the annoying reality is that racing series exist because of that sponsorship cash. If sponsors won’t make the jump to digital media and live streams with them, the future of racing could be very bleak.